Like the 77% of small businesses that give to charities every year,1 you hope your donations make a lasting impact. You can trust one of these best charities to put your money where it counts. Donating time, money, and other contributions to charities is a time-honored way for small businesses to help their communities—and earn a bit of tax relief. But if you’re looking to improve your community, how do you know which organizations you can trust to use your donations effectively? 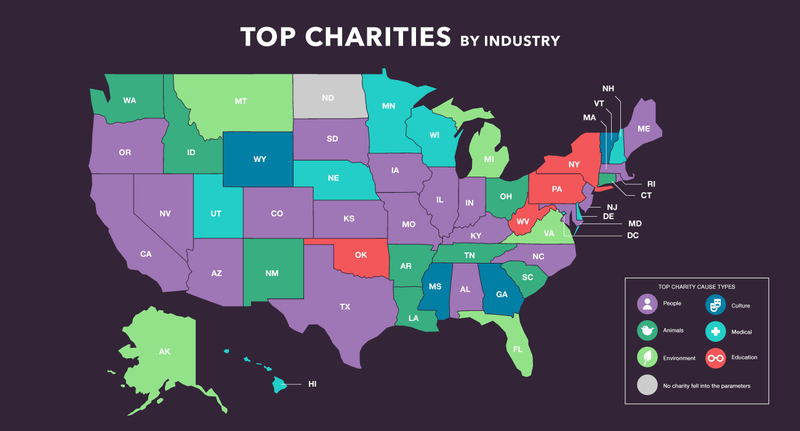 Plenty of charities take in loads of donations and run sizable programs, but many use large portions of the funds to cover marketing, salaries, and other administrative costs. And unfortunately, some charities exist as not much more than smoke-and-mirror schemes. But don’t get frustrated and walk away from charitable giving. Many organizations keep their program expenses low and their service levels high, meaning your dollars go further toward the causes you want to support. We set out to find those highly efficient charities. Using data collected by Charity Navigator on organizations in every state, we compared financial information, transparency policies, and public reviews. We looked at financial, accountability, and transparency scores and administrative-to-program cost ratios. We then assigned our top ratings to the best charities that do the most with their donations across the nation. The types of causes championed by the most effective charities vary widely, but we did find many animals rights, food bank, social service, and environmental protection organizations. Our highest-rated charities had an average fundraising efficiency—the amount spent to raise $1—of only $0.07. The lowest-rated associations averaged four times that amount, at $0.29. The top organizations averaged a rate of 86.43% for contributions that go directly back into the programs. The lowest averaged 60.18%, or 30% less. The least efficient charities—those that spend large portions on fundraising and administrative costs—were also the least transparent and often had warning notices from watch groups like Charity Navigator. Four particular charities stood out among the rest, each receiving a perfect financial transparency score of 100. If you want your donations to make the most significant difference, these organizations lead by example. With a mission that “brings people together to build homes, communities, and hope,” San Gabriel Valley Habitat for Humanity has been helping people reshape their lives since 1990. Businesses can give time and money to directly impact the lives of Southern California residents, many of whom experience challenges stemming from the recent recession and ongoing affordable housing crisis. With only 6.8% of its budget going to administrative costs, you can be sure that San Gabriel Valley Habitat for Humanity will use your donations effectively. Weld Food Bank is “turning the tables on hunger” by helping to feed the 20% of Weld County, CO, residents who go hungry without adequate access to food.2 From kids’ backpack and school food pantry programs to senior feeding programs and emergency food boxes, the Weld Food Bank exemplifies leadership in the fight against hunger. The organization uses more than 98% of its donations to fund its programs, making it a genuinely effective and transparent way to give back. The Food Bank of Siouxland, which serves hungry populations throughout Iowa and Nebraska, has the best program expense ratio of any charity we uncovered during our research. An outstanding 98.6% of donations cover the costs of its programs, including various educational programs and a mobile pantry for families and kids. Your business can donate funds and produce or even host a food drive of your own to help people avoid going hungry. Reading is a fundamental part of effective education and can greatly improve children’s lives. Spread the Word Nevada is dedicated to increasing literacy in its communities with programs that get kids reading books and that reinforce the role of literacy with parents. With 505,000 students served in its 17 years,3 the organization provides volunteer opportunities like live readings, book drives, and book and money donations. We relied on regional rather than national metrics and excluded foundations and nonprofits categorized as “grantmakers,” meaning they raise money to redistribute to other charities. Our focus was on nonprofits doing the on-the-ground work themselves. We also excluded some particularly politically motivated groups and organizations that, according to Charity Navigator, accept federal grants. At Business.org, our mission is to help decision makers find the right tools and services to grow your business, and we believe that building a business should include giving back to our communities too. We hope you consider one of these highly productive and influential charities to spend a bit of your time and money. Ithink you meant this link https://www.ecocenter.org/ for the michigan top organization. You linked to a california org.